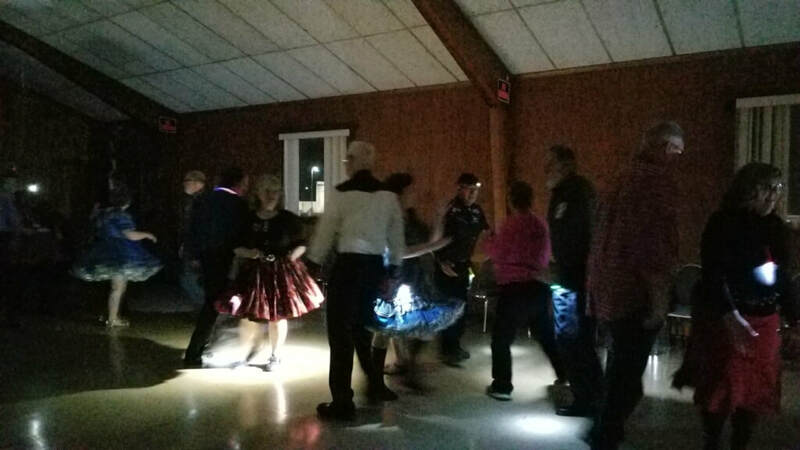 There was movie and TV nostalgia at the Hollywood/Disney/Movies/TV dance on Saturday February 23rd. The top left picture shows the Guest Visitors from the Panhandlers Square Dance Club from West Virginia. 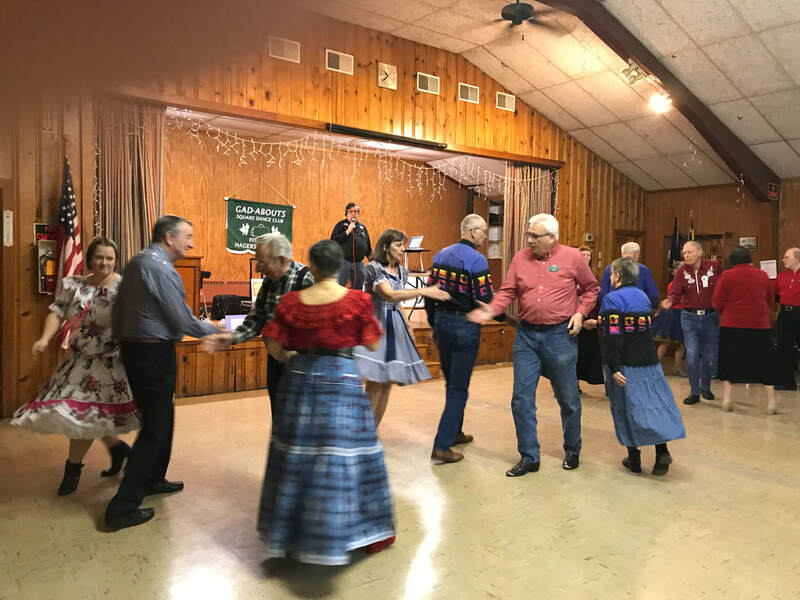 The top right picture shows the Guest Visitors from the Swing Thru Square Dance Club of Lancaster Pennsylvania. The bottom left picture shows the dancers sporting their dance theme related garb. See a corresponding video in the Video Gallery. 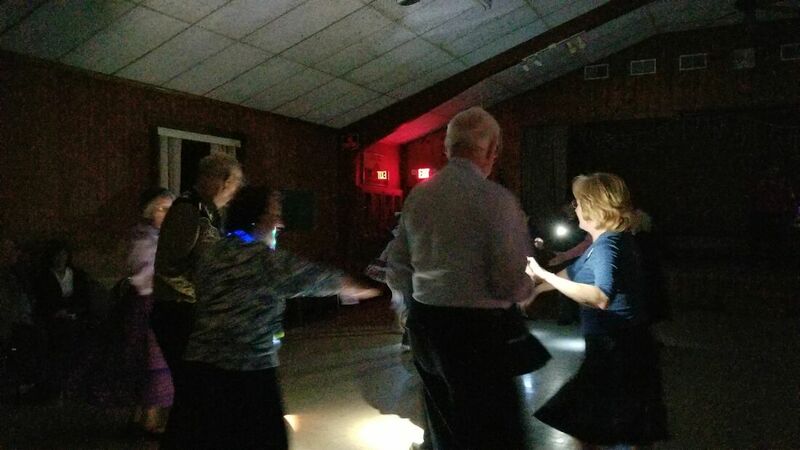 On Saturday February 9th there was a hooting and a hollering to the calls of Club Caller Art Lavigne at the good old fashioned Country Hoedown dance. There was an eerie sensation when the ceiling lights went out and the Flashlights and other lights lit up the darkness at the Flashlight Dance on Saturday 26th. 1/7/19 Pennsylvania farm show exhibition! On Monday January 7th one square of the Gad-Abouts attended and performed in exhibition and competition at the Pennsylvania Farm Show in Harrisburg. Pictured on the above left is the square waiting to enter the Parade of Squares at the beginning of the show. The above right photo is the square assembling in their designated spot 47. The Gad-Abouts attendees were Marjorie Barber, Dan Grimes, Bob Lawn, Marvin Horst, Marcia Horst, Reed Lofton, and Carol Keener. Videos are in the Video Gallery. 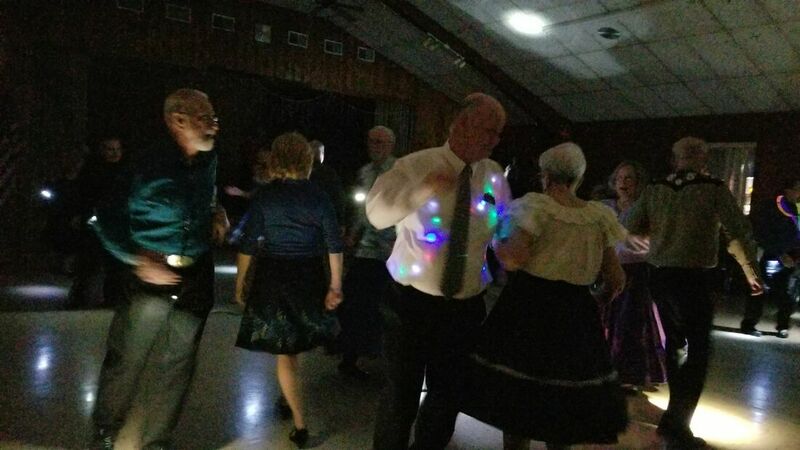 ​The Holiday Season was ushered in with style at the Gad-Abouts Christmas Dance on December 8th. New student dancers from the Gad-Abouts and Frederick County Promenaders attended. 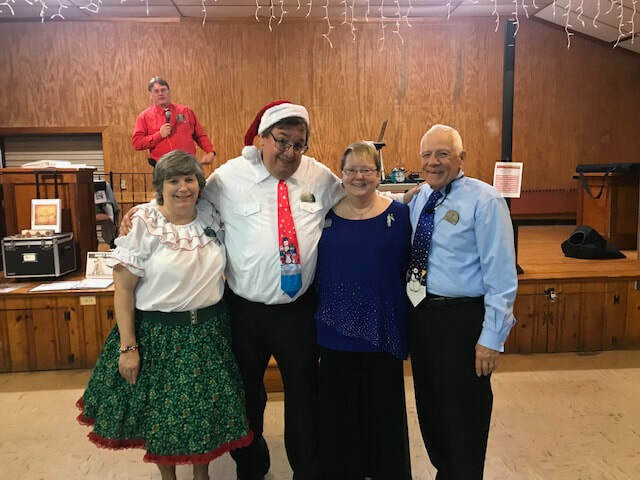 Pictured above is Amy & Club Caller Art LaVigne, Roberta Harris, and Club Cuer Butch Bloxom. As the above picture shows, the Support Your Cause colors were plentiful at the dance on October 13th. 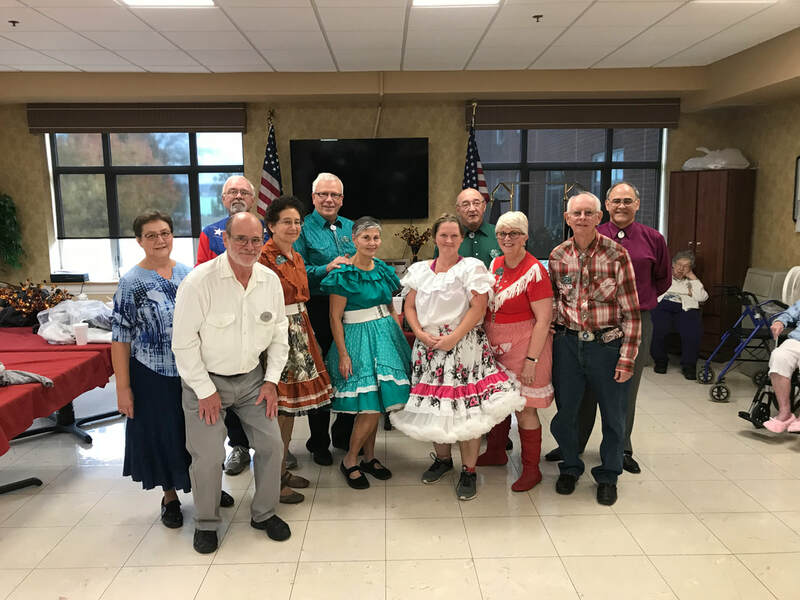 On Wednesday 10/29/18, led by club co-presidents Bob Lawn and Marvin Horst, a contingent of Gad-Abouts went to the Julia Manor Home for a square dancing demonstration. The picture on the above left shows the contingent in square formation awaiting the calls of Dan Grimes. The picture on the bottom left is the contingent. See the Video Gallery page for two videos from the event. 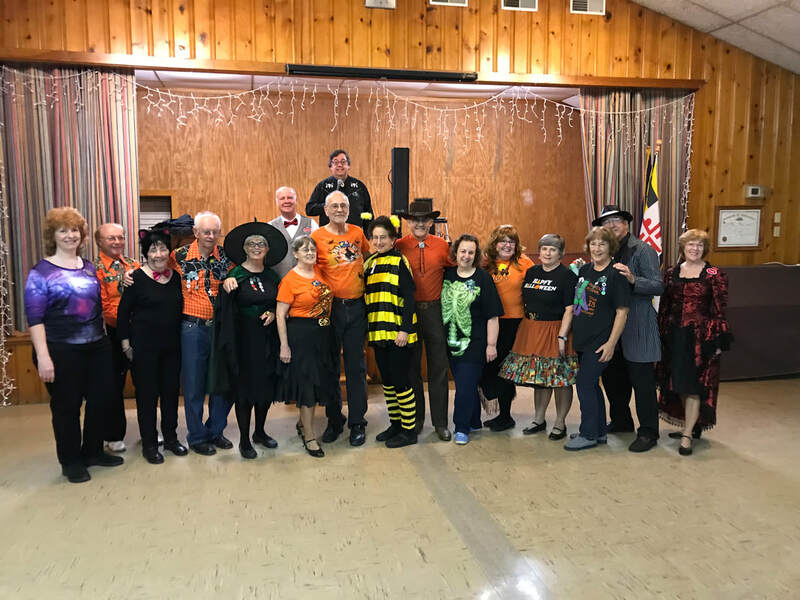 It was Callers Choice night with a Halloween flavor at the Gad-Abouts dance on October 27th. Who is that member in the middle of the picture with the Pittsburgh Steelers retro uniform on? I am sure that Dan Grimes liked that. Pictured are the members in their Halloween regalia. 9/22/18 SPORTS TEAM JERSEY DANCE! The Gad-Abouts had their annual Sports Team Jersey dance on Saturday September 22nd. 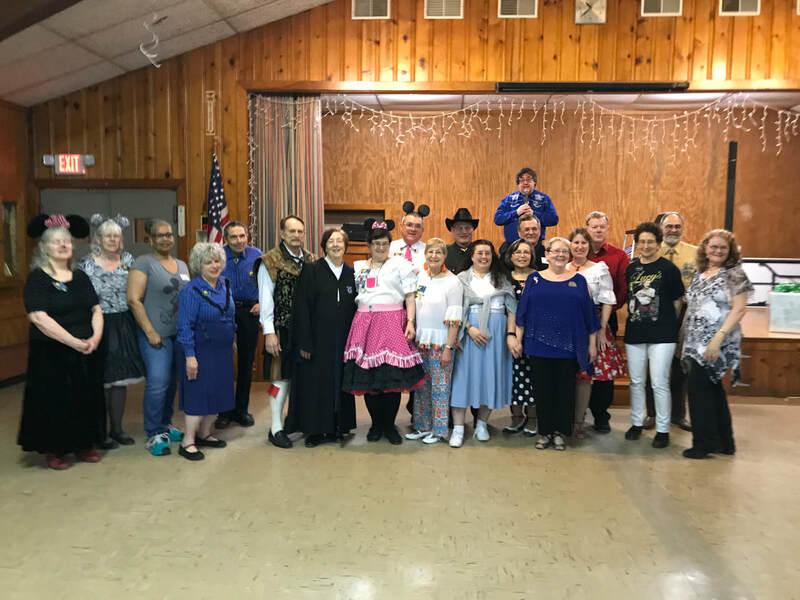 ​On May 19th, a square of Gad-Abouts club members were invited to give a square dance demonstration and participation mixer for a scholarship fund raising event at the Mont Alto campus of Penn State. The top picture shows the Gad-Abouts members next to the Guest Caller for the event. 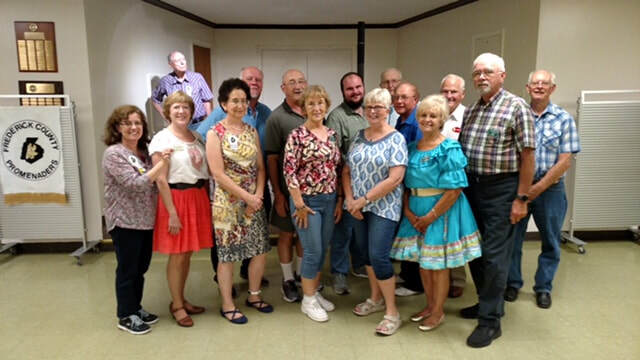 Pictured from L to R are: Bob Engel (Guest Caller), Marjorie Barber, Dan Grimes, Club President Bob Lawn, Club Secretary Martha Thompson, Bill Bucher, Mary Rogers, Donna Lofton, and Reed Lofton. Also in the picture is the Penn State Nittany Lion Mascot. The bottom left picture is the table that the members sat at for the fund raising dinner. The bottom right picture is the souvenir mug that was given to each club member. ​At the Saturday April 28th Graduation Dance, the Gad-Abouts presented certificates to the students upon their successful completion of the 2017-2018 Mainstream & Plus Dance Class. Pictured above are the students along with Club Caller Art LaVigne. The student graduates are: Lynann Adams, Amy Frost, David Frost, Tiffany Griffin, Christel Jenny, Sanannah Lushbaugh, Dennis Pennett, Kim Roberts, Walt Roberts, and Kendall Whittington. 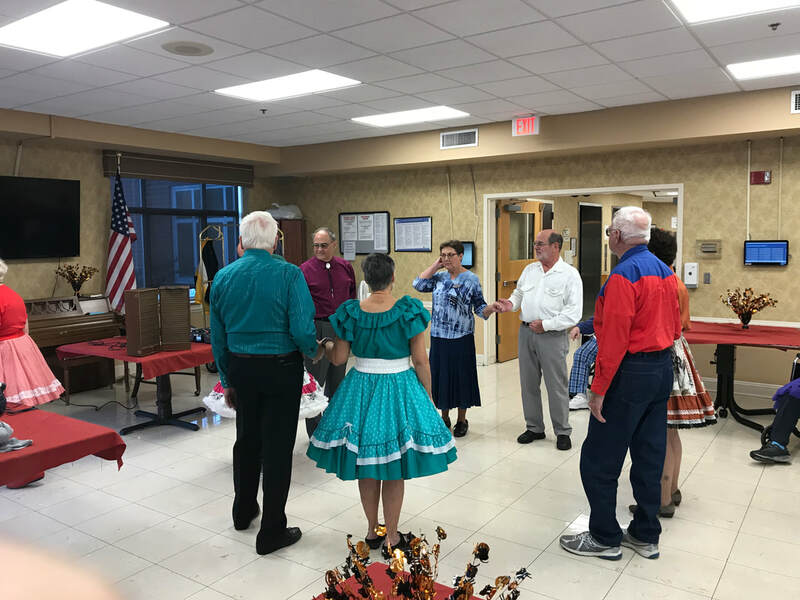 ​On Thursday April 26th, nine Gad-Abouts visited the Julia Manor Health Care Center for an afternoon square dancing demonstration. 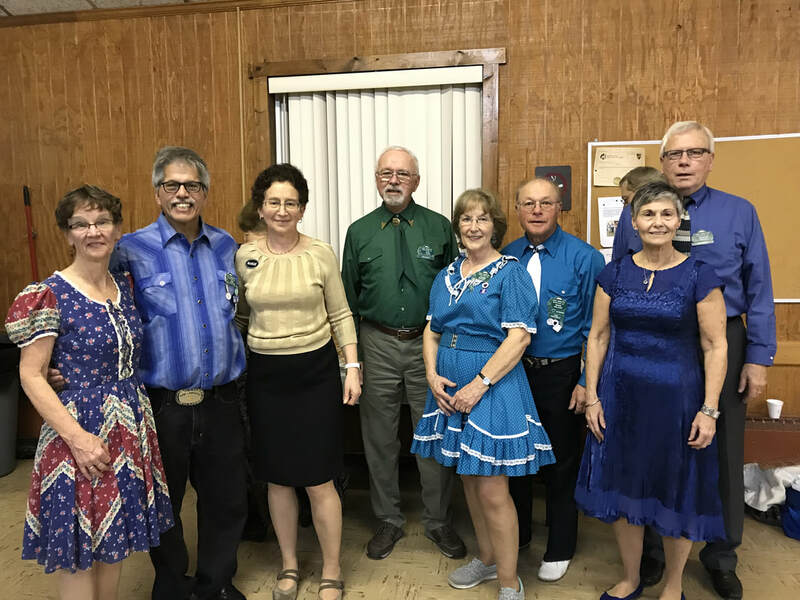 Pictured from left to right are club members Scott Gilbert, Tiffany Griffin, Bob Lawn, Lou Thompson, Marjorie Barber, Jeremy Springer, Dan Grimes, Marvin Horst, and Marcia Horst. 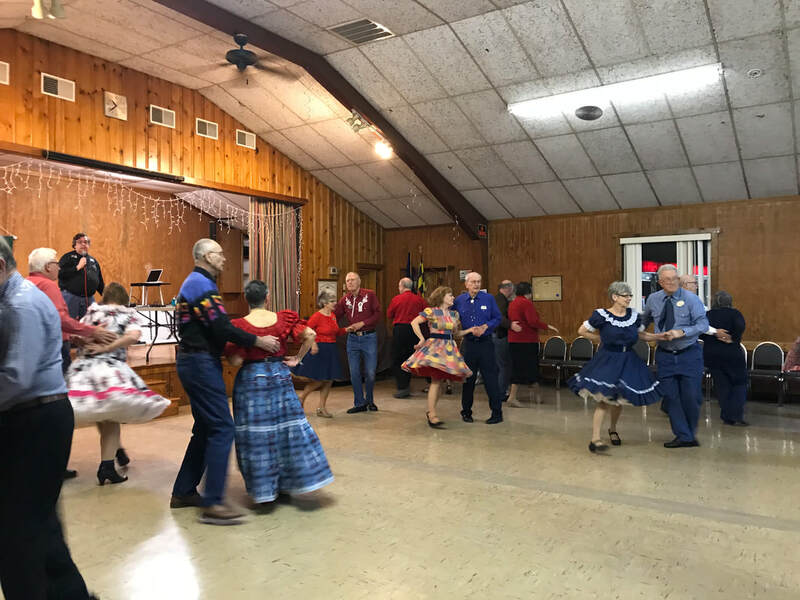 ​On February 23rd, 10 members of the Gad-Abouts visited the Do-Pa-So square dance club in Lancaster PA. 8 of the members led by Club President Bob Lawn are pictured above. ​Matt Worley with his psychedelic shoes was the Guest Caller at the recent Spring Fling dance. I just wonder how often he needs to change the batteries in those things? Kudos to Matt for that innovative accessory. 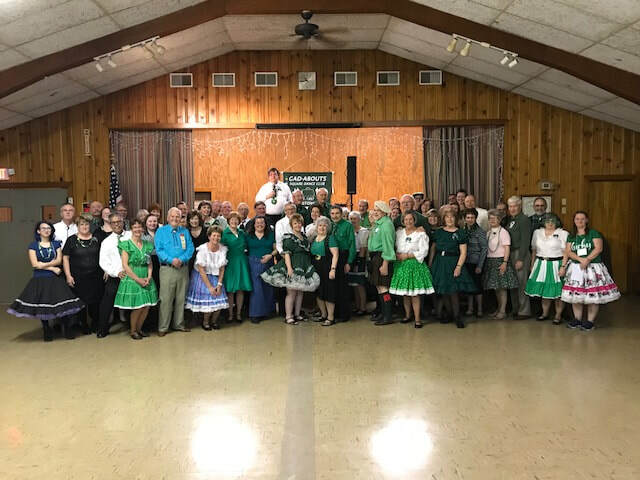 3/10/18 WEARIN' O' THE GREEN DANCE! ​​A sea of green at the March 10th Wearin' O' The Green dance. 01/18/18 Pennsylvania Farm Show Exhibition! The Gad-Abouts club members proudly wearing their Superior Performance blue ribbons after their performance at the Pennsylvania State Farm Show in Harrisburg PA.
12/6/17 - FLIRTS & SKIRTS VISITATION! 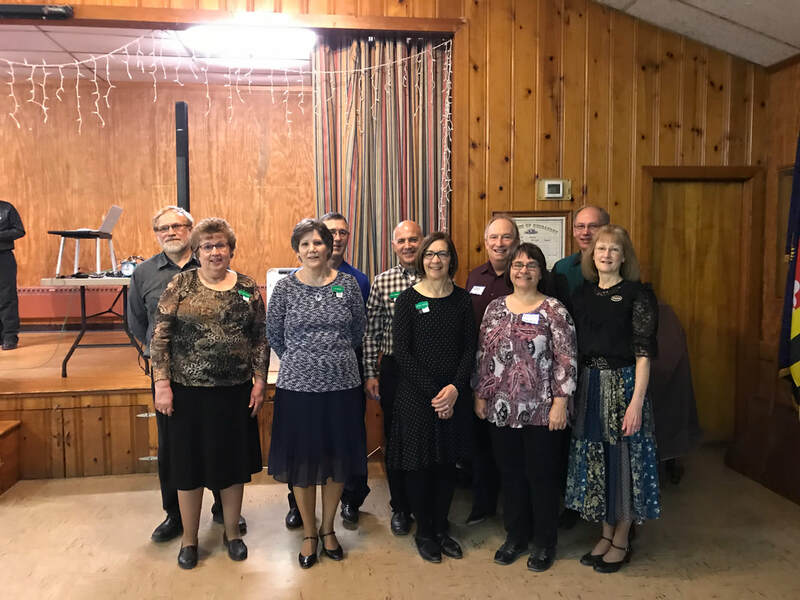 ​On December 6th 2017, the Gad-Abouts went on a road trip to visit the Flirts & Skirts Square Dance Club in Dillsburg, PA. Pictured above are the Gad-Abouts members who went on the road trip. 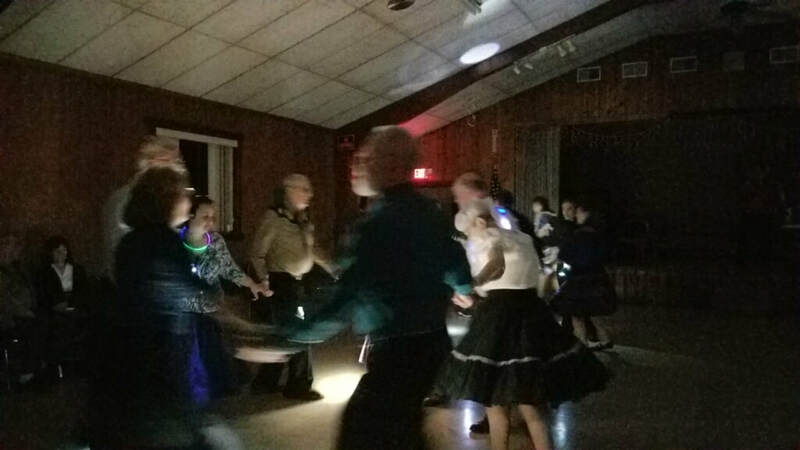 ​Poodle Skirts were featured and worn by these Gad-Abouts club members at the recent Rock & Roll dance. Pictured from left to right are: Marjorie Barber, Marcia Horst, Pam Beale, Ruth Reis, and Judy Daniels. 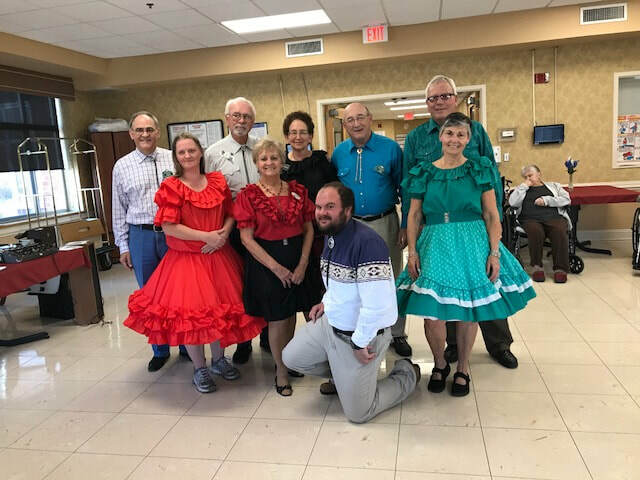 ​On Wednesday June 14, the Gad-Abouts and Frederick County Promenaders teamed up for a square dance demonstration at the Coffman Nursing Home in Hagerstown MD. This Flag Day event called by Gad-Abouts President Dan Grimes featured patriotic dance attire and music. 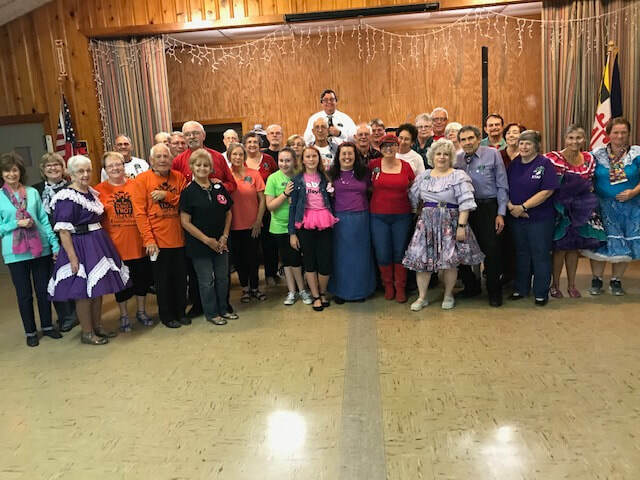 On Saturday April 15, 2017, members of the Gad-Abouts went on a road trip to Wheeling West Virginia to attend a square dancing event. Thanks to Dan Grimes for organizing the mutli-club trip. Tom Miller was the Guest Caller at the Gad-Abouts square dance on 11/26/2016. 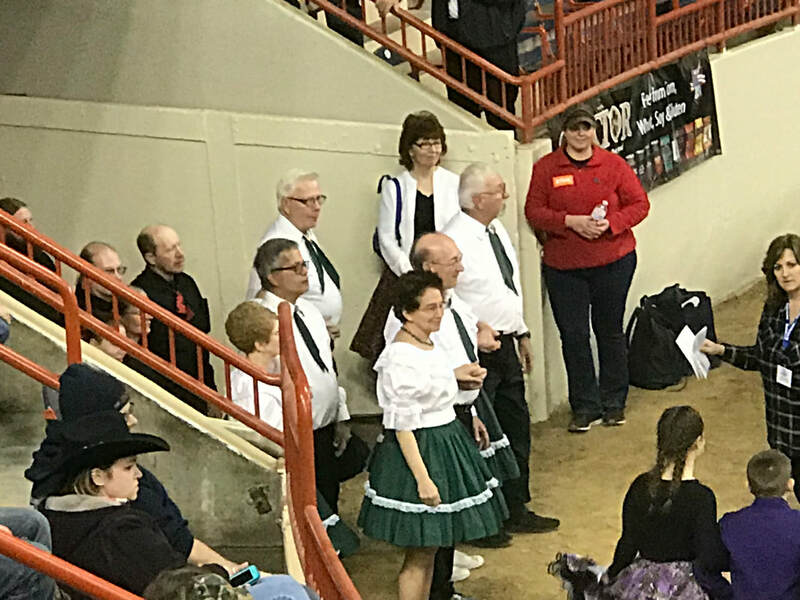 The Gad-Abouts members at their assigned square dancing location at the Pennsylvania Farm Show in Harrisburg PA. The Gad-Abouts square dancers marching around the performance arena towards their designated location. On Sunday June 4th, 2016, the Gad-Abouts hosted a square dancing demonstration in the outfield prior to the Hagerstown Suns minor league baseball game. Clubs from all over the region participated in the event. Many thanks to Dan Grimes of the Gad-Abouts for organizing this square dancing showcase. 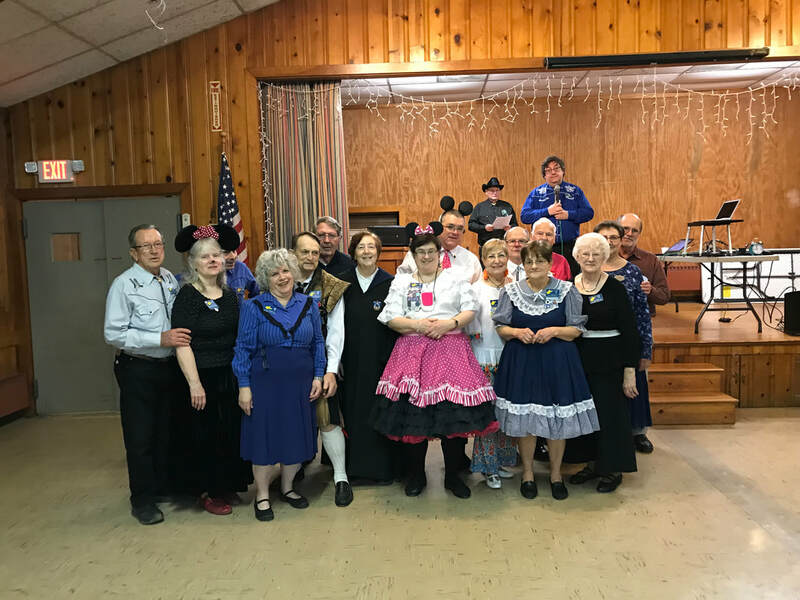 Pictured above are the square dancing participants. On December 22, 2016, members of the Gad-Abouts performed a community service by gift wrapping gifts for the Red Cross at the Valley Mall in Hagerstown. 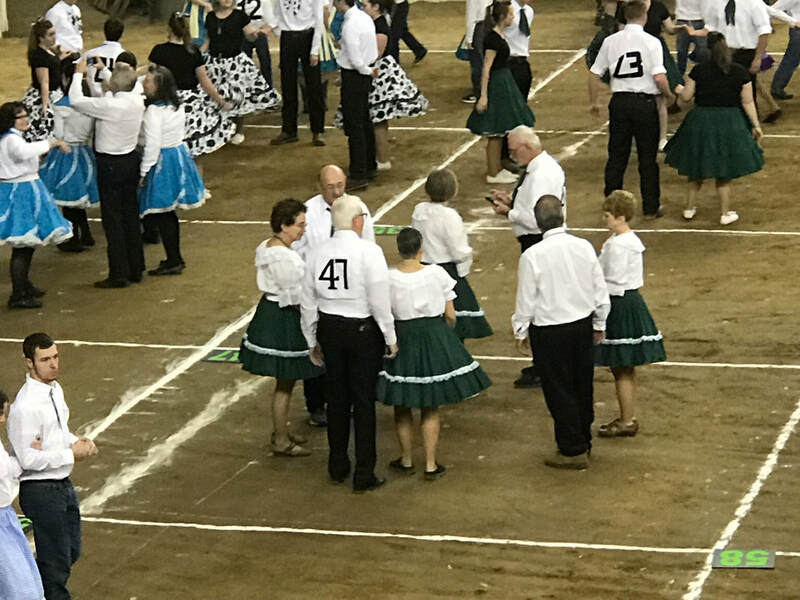 Members of the Gad-Abouts sport their favorite team jerseys at the Jersey Night square dance during the 2016-2017 dance season.